A poll from Alliance for Market Solutions shows that, aside from any political affiliation, “slightly over three-fourths of Millennials agree that humans should take steps to slow or stop climate change.” Usually a taboo topic, this generation of early- 20s to late-30-year-olds is not shy about weighing in. This is truly a group of people who demand sustainability in their daily lives and similarly, in their homes. This is true, not only for the sake of comfort and savings but because of a world view that prioritizes the health and safety of their futures. The idea and practice of energy efficiency has become more than a consumer demand for my generation—it has become our cultural movement. Homebuyers are taking note and are seeking homes with energy efficient features. Portland OR, a city whose median age is 36, has a real estate market that is being flooded by newcomers from all over the country. A new “Home Energy Score Ordinance” has been initiated this year in Portland. This program enhances consumer awareness, immediately initiates a cultural energy conversation, and promotes investment in energy efficiency. For a home to be listed on the public MLS, it needs to have an official Home Energy Score completed by an approved Assessor. The U.S. Department of Energy (DOE) describes their Home Energy Score program as a report that “…estimates a home’s energy use, associated costs and provides energy solutions to cost-effectively improve the home’s efficiency. Each Home Energy Score is shown on a simple one-to-ten scale, where a ten represents the most efficient homes.” This allows potential buyers in a real estate transaction to understand the estimated energy costs to expect from the home. In many instances homebuyers are unaware of the ease and availability of this information. Normal agent-to-client discussions cover property taxes and the homeowner’s insurance rates but typically don’t educate their clients about energy costs. The U.S. Census shows that besides the mortgage payment, energy bills are the highest annual cost to a homeowner, and as such deserve to be a major consideration when home buyers calculate their projected monthly expenses. Many millennial buyers are more focused on the monthly costs than the selling price. Besides the actual cost of the mortgage, energy will be the biggest impact on the monthly outlay. When a real estate professional recommends the Home Energy Score, it sets them apart because it gives their clients a valuable tool to simply and accurately project their monthly expenses. From a real estate perspective, when it comes to giving a home a “score” there is believed to be an ill-fated outcome… a low score. This is a shortsighted view for buyers, sellers, and homeowners as a whole. As the DOE states in their literature for Home Energy Score recipients, “A low score does not mean your home is poorly built, and a high score does not mean your home cannot improve.” The Home Energy Score rates a home and estimates the actual energy cost and discloses how much homebuyers can save by implementing listed recommendations. This furthers a consumer’s awareness to their “total investment opportunity.” The strength of this in the real estate transaction has been proven in a study by Elevate Energy in which “… analysis shows that the Chicago single family real estate listings that disclosed energy costs spent less time on the market and had a higher closing rate,” regardless of the energy costs being high or low. This allows the real estate professional to sell faster, and the client to buy smarter. The study also suggests that energy disclosure will affect the seller positively. Initiating the Home Energy Score at the time of listing, like in Portland, shows that the home will spend less time on the market. Not to mention, homes that do contain energy efficient assets can help to increase the resale value of the home. If a real estate professional or home inspector can identify energy efficient aspects, recommending a Home Energy Score to your client may help them sell their home faster and give them a larger price tag! A study by Redfin shows that “energy efficient homes sell for seven percent more” than the median sale price. The Home Energy Score can also help a lower-scoring home with its recommendations to increase the score. Sellers in Portland are opting to add insulation over new paint to improve their Home Energy Score and make their listing more competitive. An article from the Oregonian, a Portland-based newspaper, quotes Hilary Bourasa, a principal broker with Meadows Group Inc., talking about the newly initiated Home Energy Score ordinance. “It’s taking the focus away from granite countertops and stainless-steel appliances and putting it on housing affordability,” Bourasa said. Energy efficiency adds housing affordability in the form of reduced energy bills for the owner or buyer, adds more value to the home for the seller, and leverages the home in a competitive market. If you want to sell your home, energy efficiency is the new granite countertop. Everyone wants it! Home inspector expo conference halls are filled with new technologies built to handle the online service demand with millennial “clickbait.” These products give consumers greater access to their services. Likewise, such tech has improved the productivity of inspectors. The Department of Energy (DOE) provides an online scoring tool for approved inspectors that will instantly generate fully formatted reports ready for delivery. App-based and integrated tools are working their way into inspection software to make the Home Energy Score a ten-minute addition to the average home inspection. Clients can fulfill the one-stop shop they desire when choosing a home inspector or home inspection company who offers the Home Energy Score. DOE program partners provide their approved assessors with materials, presentations and resources designed specifically for home inspectors to market to the real estate community. 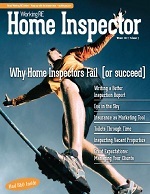 Inspectors can help an agent sell a home faster, for more money, and surpass their client’s expectations of service! It has become common practice for inspectors to diversify by offering and marketing additional services to comply with growing needs of clients and real estate professionals. Still, many of these services are typical of most experienced inspectors. The Home Energy Score is a valued service that will separate an inspector from their competitors instantly, as energy is all the rage and boasts major benefits to all parties involved. Many inspectors who have already become Home Energy Score assessors are receiving interest solely by being approved by the U.S. Department of Energy. Not just a federal department, also a highly recognized brand to wear on their sleeve. As a millennial myself, I am not only reporting the vast findings and statistics of surrounding studies, but asking the inspectors of America to make a move and change the game. Demand will only continue to grow for energy efficiency as a force in the marketplace, and this is the inspection industry’s opportunity to get in on the ground floor. An opportunity to use their outstanding building knowledge and experience to generate a service that has a greater and deeper impact on each client and community. The fleet of energy-concerned millennials is not a fading trend…the new kids on the block are here to stay. 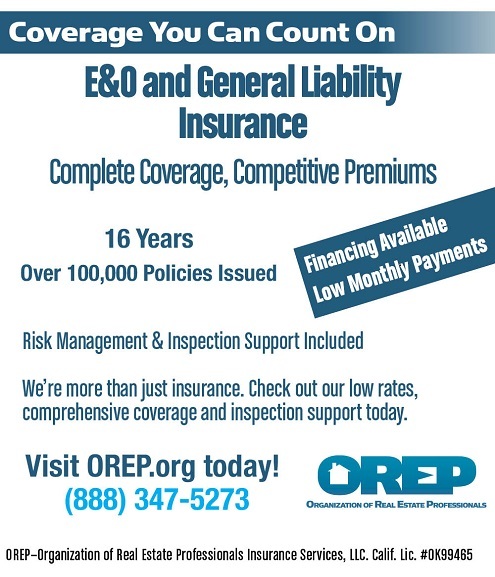 David Brauner, Senior Broker at OREP, shares insights and advice gained over 25+ years of providing E&O insurance for inspectors, showing you how to protect yourself and your business. Watch Now! Brent received his degree in Interior Design and quickly sought out to find solutions to energy efficiency. Working with the U.S. DOE he became a Home Energy Sore Assessor, Mentor, received a BPI certification, and helped to form I.D. Energy as the Home Energy Score Program Manager. In January 2018 Brent was awarded the U.S. DOE Leadership Award for “Championing the Home Energy Score” and continues to work with assessors and real estate professional nationally. 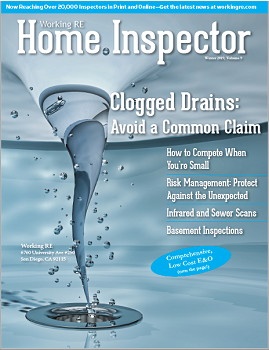 Note: The Winter 2019 issue of Working RE Inspector mailed to over 20,000 home inspectors nationwide. OREP Insureds enjoy guaranteed delivery of each print magazine and many more benefits. A relevant article for the day. I received my certification through I.D. Energy and was trained by the author, Brent. Since that time, energy efficiency as the main topic of conversation has increased during my inspections. Contractors have asked for advice on how to improve efficiency without adding to the overall cost of building a new house. The topic is “top of the mind” and as inspectors, we can have an impact on how the future is built. While the number of DOE certified inspectors is growing, that certification is not held by anyone else in my area, setting me up to be the “go to” person for answers. I would recommend getting the certification and being a part of the leading edge. Certification sets you apart.